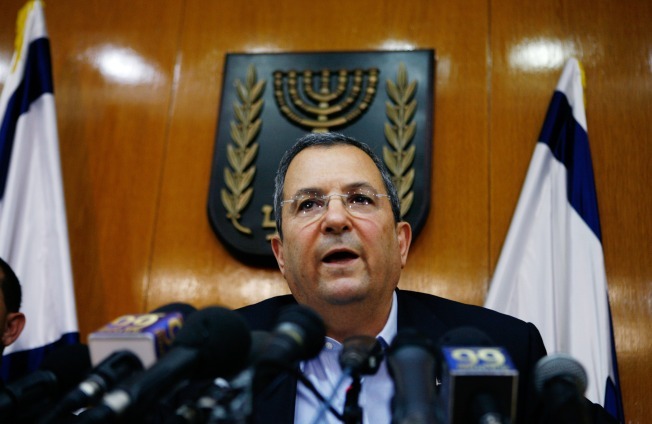 \Israeli Defence Minister Ehud Barak speaks during a May press conference in Jerusalem. Barak said it may be time to pursue an overall peace deal for the region since individual negotiations with Syria and the Palestinians have made little progress. JERUSALEM –– Israeli leaders are seriously considering a dormant Saudi plan offering a comprehensive peace between Israel and the Arab world in exchange for lands captured during the 1967 war, Defense Minister Ehud Barak said Sunday. Saudi Arabia first proposed the peace initiative in 2002, offering pan-Arab recognition of Israel in exchange for Israel's withdrawal from Arab lands captured in 1967 — the West Bank, Gaza Strip, east Jerusalem and the Golan Heights. "There is definitely room to introduce a comprehensive Israeli plan to counter the Saudi plan that would be the basis for a discussion on overall regional peace," Barak told Israel's Army Radio. He noted the "deep, joint interest" with moderate Arab leaders in containing Iran's nuclear ambitions and limiting the influence of the radical Islamic Hezbollah movement in Lebanon and Hamas in Gaza. Yuval Steinitz, an Israeli lawmaker from the conservative opposition Likud Party and a member of parliament's Foreign Affairs and Defense Committee, said that for Israel the Saudi plan is a nonstarter and called Barak's remarks "an empty political gesture." "It doesn't recognize Israel's right to defensible borders...(and) demands Palestinian refugees settle in the Jewish state as well as the Palestinian state, which is totally unacceptable," he said.